1,The CamKing makes frozen yogurt,ice cream,sorbet-even frozen drinks-in 15-25 minutes or less. 2,On/Off switch,Add fresh ingredients to the mixing bowl, turn on the machine,and go.It’s fully automatic.Plus,cleanup is a breeze. 3,The large capacity mixing quick freeze bowl lets you make up to 500ml of your favorite smooth and creamy frozen treats. 4,Standard plug (Exerted Length of Cord: 120cm). 5,Anti skid rubber on bottom of the unit. 6,Noise level: 65dba(30cm all around the unit,measured in ideal state). Make delicious homemade ice cream, sorbet or frozen yoghurt for your family and friends to enjoy. In about 15-20 minutes you can enjoy a fantastic ice cream, delicious and far healthier than a shop-bought one. 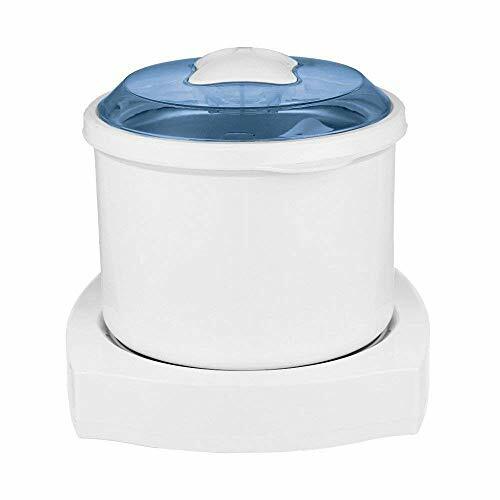 CamKing Ice Cream Maker come with quick freeze bowl eliminates the need for ice. Detachable parts for easy cleaning. You can disassembled this ice cream maker machine to clean, just wash the detached parts under running water and then wipe dry. Low Noise (65dba), it can be very quite while working. weight 2.25kg, it is very small and lightweight,space saving.